Hometech Electrical Appliances Co., Ltd.
1) Multifunctional: Stir frying,Oiless fry, Roast,Bake, BBQ, Grill, Broil,etc. 2)Quick cooking: Fry chips in 25-30 mins, Roast 1kgs chicken in 20 mins. 3)Even cooking: Turbo air & Food rotating ensure even cooking. 3D heating! 4) Healthy Cooking: Fat & Oil free. 5)Easy cooking: Set time&Temp. , then air fryer does all. 6) Perfect cooking: Foods become crispy outside, and juicy inside. 7) We can see through the whole cooking from all sides. 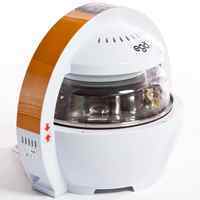 8) Easy clean-- detachable stainless steel bowl for easy-clean. 9) Patented turbo air guidance from top to the food. 10) Double safety settings, GS-A13 approved. 12) Friendly digital control , 6 one-touch programs.